As contractors, there aren't a lot of times when we have to deal with the sadness that life brings to our clients and consumers. If we’re good at our job and we want to go that extra step, then we find ways to tell them how much better things will be when we’re done with a job; or how much easier and more enjoyable their home will be. But every once in awhile, we run across projects where the whole thing starts out bad and then it’s hard to put a good spin on the job. Like when some unscrupulous scammer defrauds a person out of a lot of money on a bogus construction job, and leaves them holding the bag. Especially if the victim happens to be elderly. Take for example, an 83 year-old man and his 79 year-old wife. The “contractor” showed up one day and told them their roof needed to be replaced. The roofer did a “verbal estimate,” received a check for materials and then left. A week later, the crew showed up to “start” the job but needed more material. As the husband wasn’t home, the wife wrote another check and then the crew left. A day later the crew returned and actually began tearing off the old roof. In speaking with the husband, the contractor told him that he had to pay for permits and the last of the materials. Taking a third check from the couple, the “contractor” and his crew left and, (you guessed it) never returned - after receiving three checks totalling over $10,000. So how does this affect those of us who are honest, have a valid license, and treat our clients with respect?. It makes all contractors look bad. News stories are crowding each other out of space on the TV, over the internet, and in the papers with stories exactly like this one. Are they stories about all the things contractors do right? No. How do we make things different? What can a contractor do to fight these crooks? Actually, a lot more than you think. In many industries, you’ll hear the terms “Value Added Content” or “Value Added Experience” used when referring to customer service. Simply put, this is the concept of giving the customer more than they ask for, in a professional and timely manner. Most of do this without ever really thinking about it. For instance, we promise low and deliver high. If we think a job is going to take us a week, we say it’ll take a week and a half. This isn’t a case of even stretching the truth as much as it is building in a time factor just in case there are issues on the job (which there always are!) But in the world of building and contracting there is something else we can let our customers have the value of, and that is our experience. All of us know the right way to do our jobs, and we also know the wrong way, and most of us have even seen the outcome of someone else doing things the shady way. That is experience we can pass on to our client and potential clients. What follows is the kind of information we can pass on. 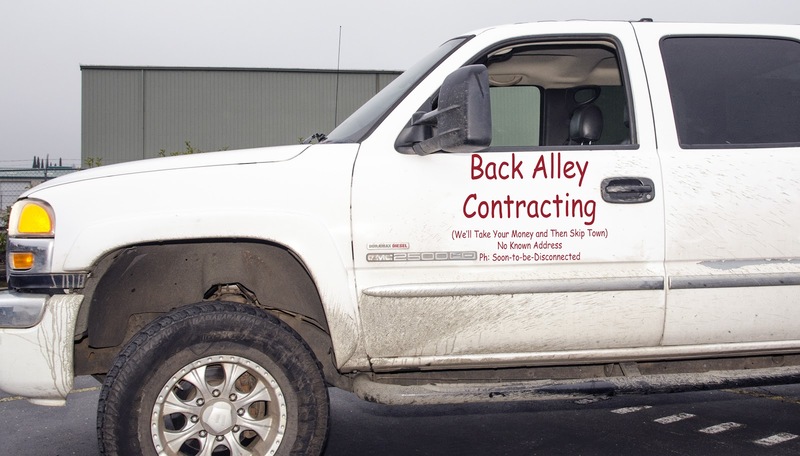 In the end, it will come back to us by way of smarter clients who are looking for good and honest contractors, with a better understanding of how we work and the benefits we can provide. The first thing a contractor should be willing to tell customers and potential customers is how they can spot a legitimate contractor. Additional information that the contractor can share with consumers is how these scam artists operate and the scams they use. The people who commit these scams and crimes have certain methods and traits in common. Some are simply because they’re crooks. For instance, they will almost always be from out of the area, and oftentimes the vehicles they drive will have out-of-state plates. They also usually won’t have their company name visible on their vehicle. Usually the scammers fall into to two categories, they will either be smooth talking and congenial, or they will be very blunt and professional sounding. Either way, they usually do very little of their business on paper, and this is something that consumers should be clued in to also. Something else that contractors can share with consumers is that these con artists will often demand a portion of the price of the job up front. One of the most common scams is that of a “contractor” showing up unsolicited at a victim’s door and talking to them about their roof or building repairs or a driveway. They will tell them they were “just driving by”, and they noticed a serious repair issue. They’ll tell the potential victim (oftentimes an elderly person) that, although they are very busy, they can start the job immediately and get it done quickly. They take a partial payment, and they’re never heard from again. Another common scam is using the tactic from above and then telling the unsuspecting victim that they can keep costs down if they use materials “from another job”. Again, either work is never started or just minor tasks are performed and then the unscrupulous builder simply disappears in the night. For the legitimate contractor, the whole purpose here is to provide that added value content we talked about earlier. The people who fall victims to the crooks lose more than just money, their confidence is always shaken and they begin to fear every builder out there. Whereas if they can see that the honest contractor is trying to advocate for them, it can ease their fears and help them feel like they can make decisions with good information. That translates into more work for the contractor in the field.